2018 update: These prices are low for a reason. I'm a band parent and director. I only pay $60-$80 per song for music. I don't believe drill should cost $5,000 to $10,000 per show. I also think that directors should be able to see how the pricing schedule works without having to have a personal sales pitch from a drill writer. Easy to Easy-Medium-Easy (grades .5 to 2.5) custom drill is priced "a la carte" which means small marching bands pay as little as $50 per page. With discounts, the price can be reduced to as little as $36 per page. That means you can have a 20 page custom show for as little as $720. Horn moves and simple choreography are included on request. Bands marching 26 - 50 - $55 per page of drill. Bands marching 50 -100 - $60 per page of drill. Bands marching 101-150 - $65 per page of drill. Bands marching 151-199 - $70 per page of drill. Bands marching 200+ - $75 per page of drill. Save $5 per page by sending the show packet before June 15. Save $10 per page by sending it before May 15. Packets received after July 15 cost $5 more per page. Packets received after August 15 cost $10 more per page. 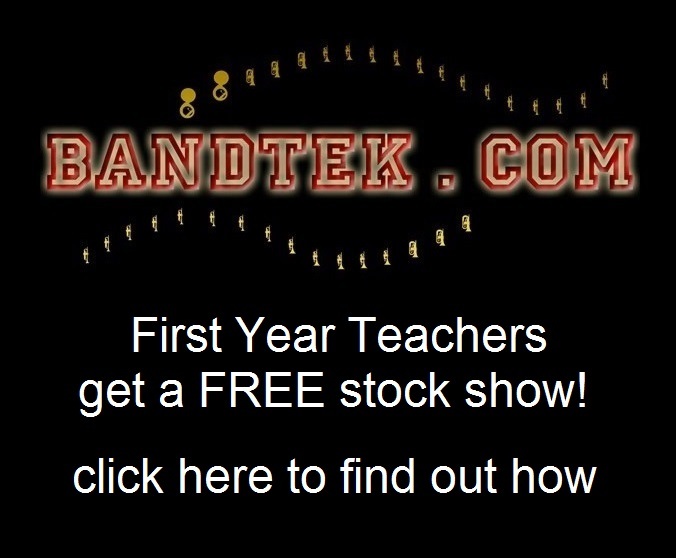 Bandtek is committed to prices your band budget can afford. Our prices are based on the size of the band, the difficulty level of the design, and how much drill the band marches. The price you pay for drill is determined by the needs of your students based on your decision as the band director. Medium and Medium Easy shows are priced by size of band. The number of pages is determined by the music and color guard needs based on collaboration with the band director, color guard coach, and drum line coach. Horn and Body movement suggestions are included on request. All orders include prop designs, flag designs, Pyware files, and videos. Personal drill book and app files are included on request at no additional charge.